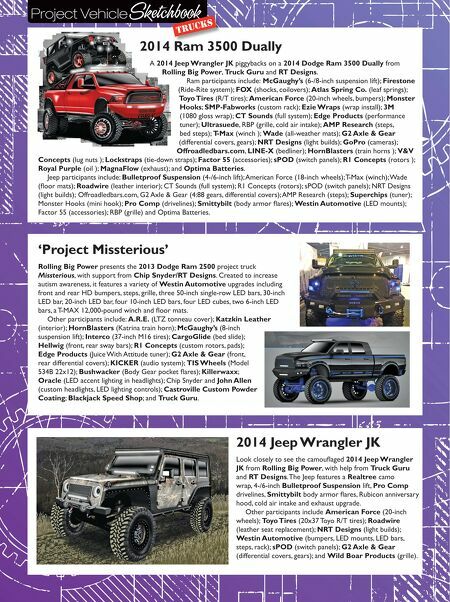 Sketchbook Project Vehicle TRUCKS January 2015 n Performance & Hotrod Business n 41 2015 Jeep Wrangler Unlimited Rubicon Dave Doetsch of Doetsch Off-Road rolls out Bulletproof, a 2015 Jeep Wrangler Unlimited Rubicon project featuring a 3.6-liter V-6 with automatic transmission, AIRAID SynthaMax cold-air intake, Gibson Performance dual cat- back exhaust, AMSOIL synthetic fluids and oils, ODYSSEY dual HD batteries, Bully Dog GT tuner and programmer and a Genesis Off-Road dual battery tray. Other participants include: Rock Krawler Suspension (X Factor long-arm suspension system); Adams Driveshaft (5150 driveshafts); Alloy USA (5.13 gears); TeraFlex (HD differential covers); 3M (matte black vinyl exterior wrap by Active Grafix); Rugged Ridge (locking fuel door, light bar, heat extraction hood, grab handles, interior trim kit); Modern Classic Enterprises MCE (flexible carbon fiber flat panel fender flares); Truck-Lite (LED headlamps, 7-inch LED lights on light bar, 4-inch LED lights on lower A-pillars); Hi-Lift Jack Co. (X-Treme off- road jack); KMC Wheels (20x9 XD Series XD807 Strike matte black wheels); Nitto Tire (40x15.5R20 Mud Grappler tires); Doetsch Shocks (2.0 remote reservoir shocks); Factor 55 (ProLink winch); WARN Industries (ZEON 10-S winch); Monster Hooks (tow hooks); JcrOffroad Inc. (front and rear bumpers); Truck Master Designs (Tactical Top slant-back hard top); BOLT Locks (single key lock assortment); Katzkin Leather (two-tone leather seats); Rhino Linings (spray-in bedliner); and Drake Automotive (billet pistol grip shifter handle). 2012 Ram 3500 Rolling Big Power sends along information on a 2012 Dodge Ram 3500 Dually project truck named Blackhawk, with assistance from Billy Grubb/RT Designs. Participants include: McGaughy's (6-/8-inch suspension lift); American Force (24-inch wheels); Toyo Tires (24-inch Open Country M/T tires); ShowTime Metal Works (bumpers, grille, trac/ ladder bars); NRT Designs (headlights); Westin (off-road LED lights); and A.R.E. (shell). 1976 Ford Bronco 4x4 Skyjacker Suspensions and Matchbox present their joint-build 1976 Ford Bronco 4x4 Real Size Edition project in honor of the 40 th anniversary of Skyjacker. 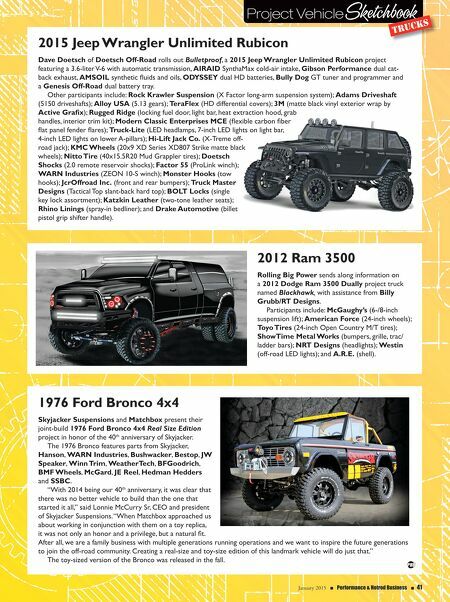 The 1976 Bronco features parts from Skyjacker, Hanson, WARN Industries, Bushwacker, Bestop, JW Speaker, Winn Trim, WeatherTech, BFGoodrich, BMF Wheels, McGard, JE Reel, Hedman Hedders and SSBC. "With 2014 being our 40 th anniversary, it was clear that there was no better vehicle to build than the one that started it all," said Lonnie McCurry Sr, CEO and president of Skyjacker Suspensions. "When Matchbox approached us about working in conjunction with them on a toy replica, it was not only an honor and a privilege, but a natural fit. After all, we are a family business with multiple generations running operations and we want to inspire the future generations to join the off-road community. Creating a real-size and toy-size edition of this landmark vehicle will do just that." The toy-sized version of the Bronco was released in the fall.